An accumulation IUL that offers transparency and flexibility with a focus on competitive distributions.2 It’s ideal for individuals and business owners who want options for growth and protection throughout their lives. 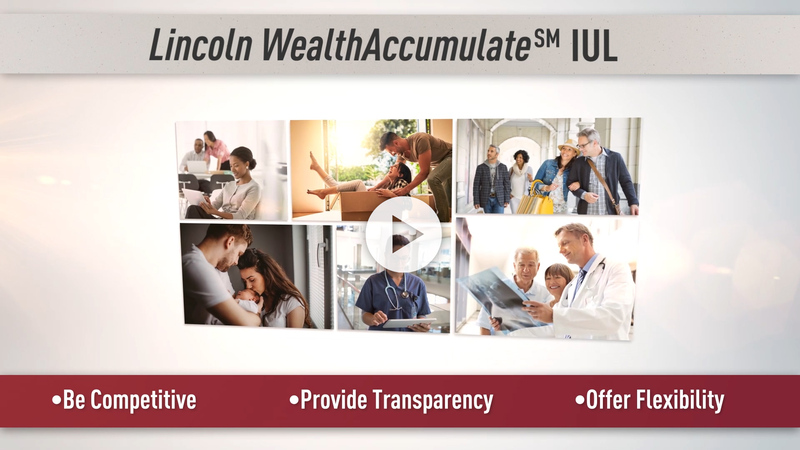 Lincoln WealthAccumulate® IUL can help them meet their needs, providing access to tax-efficient distribution potential throughout their lives. What you need to know about Lincoln's IUL. Share this with your clients. Industry-leading underwriting — consideration up to 20x income for key person coverage, lab-free opportunity, no EKG, and more. The strength of Lincoln Financial Group — For more than 100 years, we’ve remained committed to helping Americans plan for retirement, prepare for the unexpected, and protect their wealth from taxes, long-term health costs, longevity, inflation, and market risk. We have continued to keep our promises through challenging financial times, including the Great Depression and the Financial Crisis of 2008. 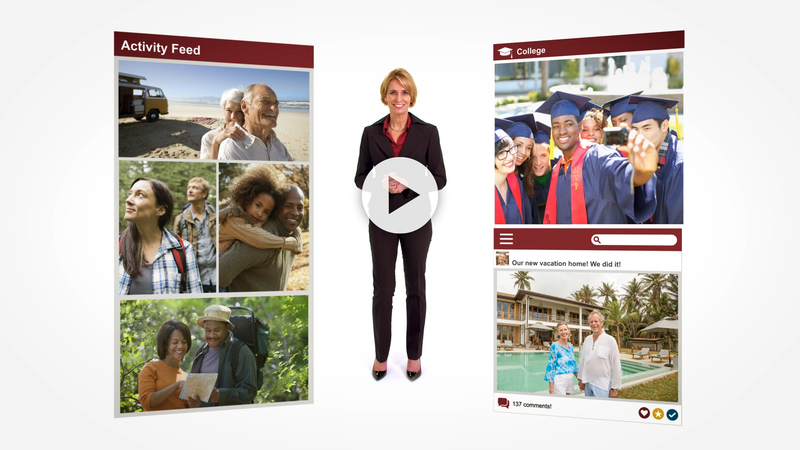 Today, more than 17 million Americans rely on us for the knowledge, experience and solutions to help them meet their goals. Target premiums are increasing by 25% on all sales. Do you have a case that this product works for? Fill out the form below to request an illustration directly from Lincoln Financial Group, or follow your normal process for requesting an illustration. Privacy | Legal | ©2018 Lincoln National Corporation. All rights reserved. 1Excluding dividends. Policy charges remain in effect and could reduce policy value. 2Loans and withdrawals reduce policy value and death benefit, may cause the policy to lapse, and may have tax implications. The S&P 500 Index is a product of S&P Dow Jones Indices LLC (“SPDJI”), and has been licensed for use by The Lincoln National Life Insurance Company. Standard & Poor's®, S&P® and S&P 500® are registered trademarks of Standard & Poor's Financial Services LLC ("S&P"); Dow Jones® is a registered trademark of Dow Jones Trademark Holdings LLC ("Dow Jones"); and these trademarks have been licensed for use by SPDJI and sublicensed for certain purposes by The Lincoln National Life Insurance Company. The Lincoln National Life Insurance Company's product is not sponsored, endorsed, sold or promoted by SPDJI, Dow Jones, S&P, their respective affiliates, and none of such parties make any representation regarding the advisability of investing in such product nor do they have any liability for any errors, omissions, or interruptions of the S&P 500 Index. Lincoln WealthAccumulate® IUL (2018) is issued on policy form ICC18UL6083/UL6083, with optional rider forms ABR-7027/ICC15ABR-7027 and ICC17ABR-7044/ABR-7044, with Surrender Value Enhancement Endorsement (SVEE) form ICC15END-7026, with optional supplemental term insurance rider forms J-5752/J-5753, and state variations by The Lincoln National Life Insurance Company, Fort Wayne, IN, and distributed by Lincoln Financial Distributors, Inc., a broker-dealer. The Lincoln National Life Insurance Company does not solicit business in the state of New York, nor is it authorized to do so. Products, riders and features are subject to state availability. Limitations and exclusions may apply. Not available in New York. Check state availability.